There are some places so beautiful that they don’t seem real – scenery that you have to stop for a moment and breathe in, because you can’t help thinking it will all disappear before you’ve had a chance to appreciate the awe-inspiring splendour. There were definitely a few locations that hit that high when I was travelling in Australia several years ago. But every now and again I go somewhere in the UK that reminds me we don’t need to travel half way across the world for amazing experiences – there are some pretty stunning places right here. Over the August Bank Holiday weekend I headed to the Lake District with my boyfriend (we’ve been together for 6 months, but we’re keeping things pretty private at the moment so he won’t be making an appearance on the blog anytime soon – although his dog is happy to pop up in the odd photo!). We camped at the National Trust Wasdale site, which is at the head of Wastwater, and walking distance from the Wasdale Head Inn. Opening our tent zip in the morning to misty mountains was pretty special. We arrived around Friday lunchtime and after pitching the tent were keen to make the most of our time, so set off on what was supposed to be a short walk up to Great End. These things don’t always go to plan however, and due to the low cloud we ended up taking a little (long) detour and reaching the top of Scafell instead! 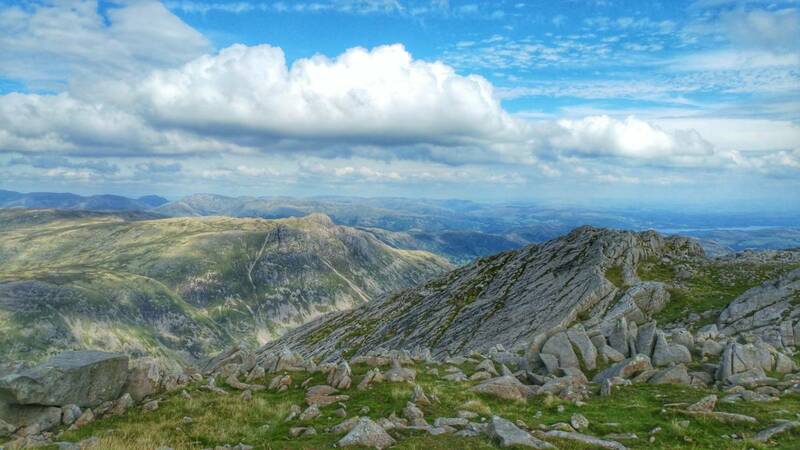 Scafell Pike, is the highest mountain in England – that will have to wait for another day – but it’s neighbour is the second highest at 964m, so still pretty cool, not that you could see much at the time! Saturday’s weather was unreal. 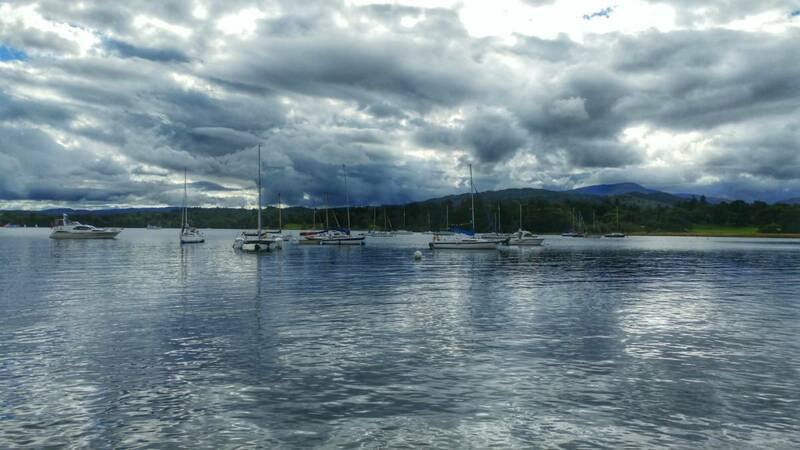 As you can imagine from the terrain The Lake District has a pretty unpredictable climate, with localised weather systems coming down off the mountains and rain and clouds fairly common. I feel incredibly lucky to have been able to experience it in all it’s glory, with the sun shining and amazing blue skies that stretched on forever! After a leisurely breakfast, we drove from Wasdale over to the Langdale Valley via Hardknott Pass. This is a single track minor road that, while being the most direct route, also has the title of the steepest road in England with a gradient of 1 in 3 in places. Needless to say it was a spectacular, but slightly hair-raising journey! I was amazed to see so many cyclists – their legs are definitely made of sterner stuff than mine to even attempt hills like that. We parked at the Old Dungeon Ghyll Hotel, and set off along a farm track before heading up a route known as The Band, a long ridge which climbs out of Great Langdale towards Bowfell. It was a very warm day, and I was glad of my Camelbak in my backpack, although I did have to pause several times to allow my lungs to recover as well! 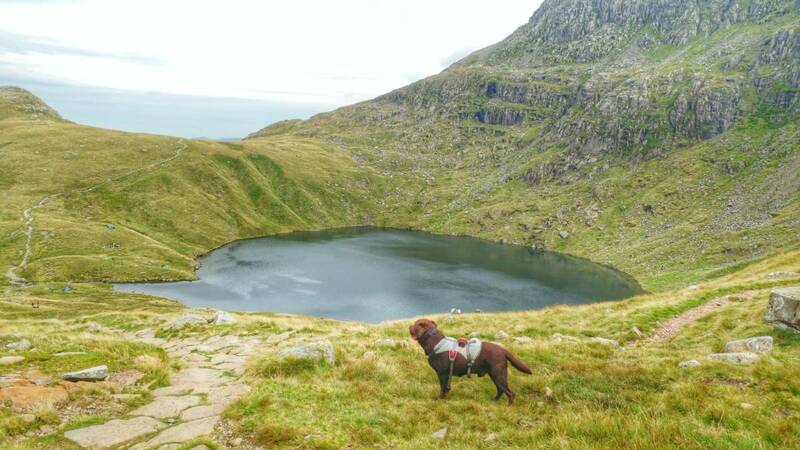 Fortunately there was plenty to look at and distract me, and before long we arrived at the Three Tarns – a series of small ponds where we stopped to have a break. The photo below is my favourite of the whole trip because when I look at it, I remember how I felt at that point – I sat on a rock while the boyfriend heated some tomato soup in his Jetboil, and just soaked it all up. It was so quiet and peaceful, my surroundings were simply stunning and I could feel that my muscles had been working hard but not to the point where I was exhausted – I was blissfully happy and really didn’t want to move! But there is always more to see, and I was itching to properly reach my first summit so we carried on climbing, up another section of steep path that runs past the very impressive Great Slab, a huge tilted sheet of rock which you can see in the below photo. We took a slight detour off the route, to go and stand on it and look down – how could you not! The geologist in me was bouncing up and down with excitement and I wanted to immediately look up how it had formed (note- the jury’s still out on that one). That had to wait however, as we were approaching the final summit of Bowfell which requires some boulder scrambling to get to the actual top and as anticipated had some amazing panoramic views. Befitting bagging my very first fell, we enjoyed a swig of sloe gin from a hip flask and I took about a million photos! 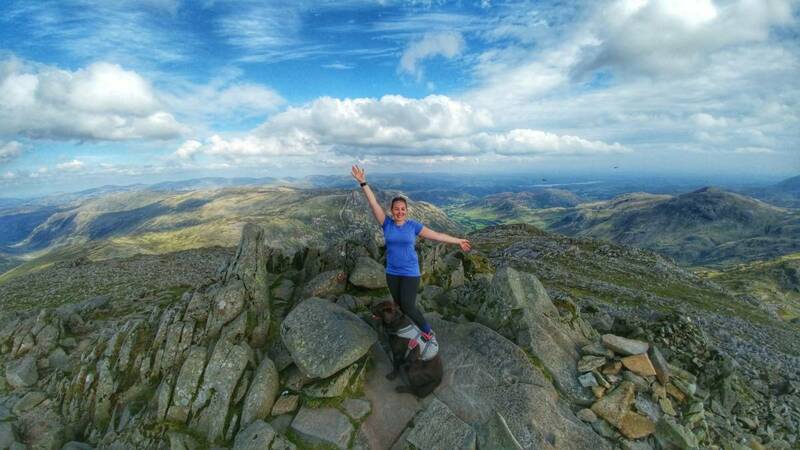 Bowfell is the sixth highest peak at 902m, and one of the most popular – it’s easy to see why with the whole of the Lake District laid out below you and feeling like you’re on top of the world! Climbing back down from the top, we headed on towards Esk Pike, another of the Southern Fells which stands at the head of the Eskdale Valley. It was a short hike from Bowfell, and again had a pretty stony summit area which definitely required a “sitting” descent technique on several sections of the path down. Peak number two – tick! We made sure to double check which route we were meant to take as we reached an open flatter section, with several possible paths – in fact, we identified where we went wrong the previous day as it was much easier to see in the sunshine. In the distance I could see a line of people making the climb up to Scafell Pike, like little ants scurrying up a ridge. Our journey turned towards Angle Tarn, another larger lake where several people were wild-camping for the night, before descending and descending and descending some more down towards Mickleden and the Cumbrian Way. My knees started to complain after a while from all the downhill and I was feeling pretty shattered by this point as well – I think the adrenaline and excitement had carried me for a lot of the way, while the soup and half a CLIF bar I ate earlier had definitely worn off! I distracted myself by inspecting the rocks I put my feet on and spotting interesting quartz veins or different coloured slate. 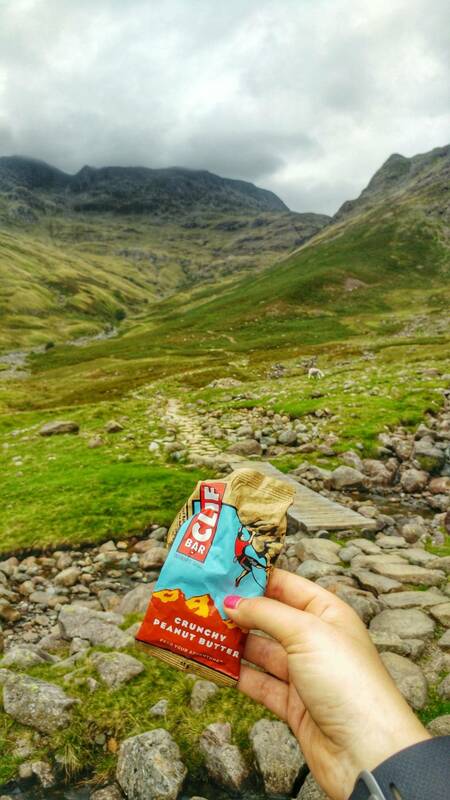 Another CLIF bar and an apple helped me to power through the last straight – the flat section back to the car park was the hardest as it seemed to go on for a long time! But I was determined not to give up – 14miles down, 2 mountains and 35,000 steps – I was pretty proud of what I’d achieved. I can still recall the smile on my face as we returned to the car and I shovelled several handful of chocolate peanuts into my mouth! We rewarded ourselves with burgers and drinks at the nearby Sticklebarn, which had a huge BBQ going on complete with donuts and s’mores for dessert – we of course had to sample the delights before driving back (the long way round) to our campsite. By this point I was basically passing out in the passenger seat, and am still not sure how my legs made it to the tent. 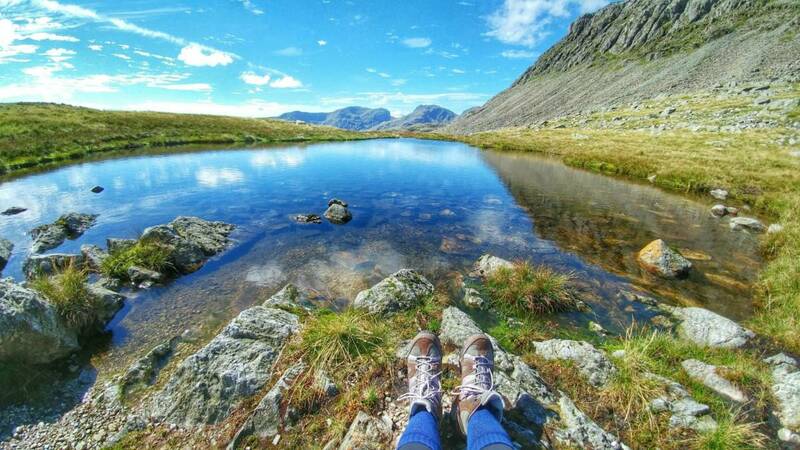 Have you been to the Lake District? What other places in the UK take your breath away? Great post! 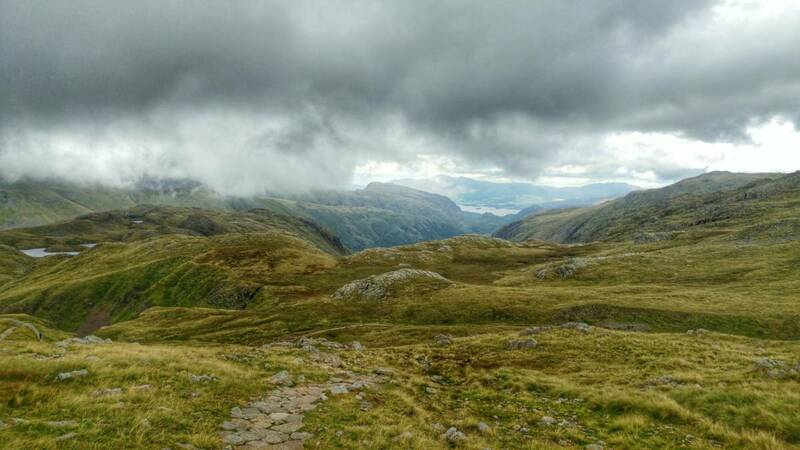 I walked down The Band from Bowfell having come across from Pike of Bliscoe and Crinkle Crags and it was evil – don’t envy you walking up it!! I need to find myself a man who likes adventures like this as it is so much better to share these adventures. Looks like some fantastic walking – hardships included! One of my favourite views in the UK (and of everywhere I’ve seen, really) is the view from Hay Bluff or the Gospel Pass out over the Wye Valley, near Hay-on-Wye in Wales. Just stunning. Beautiful pictures! I went there a few years ago one Easter, and we were pretty lucky having only one day of heavy rain! It was lovely but the car journey took so long, we did think that we could have flown to New York in the same amount of time! These photos are just stunning! 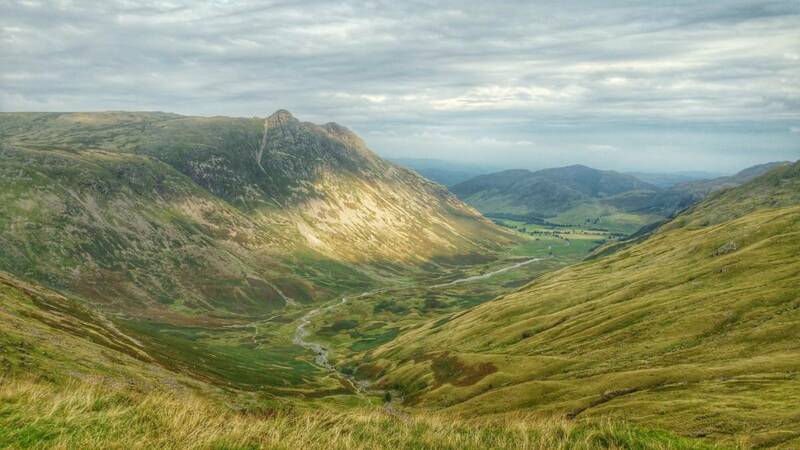 The Lake District has been on my list for so long, but I’ve never managed to get there. I think I’m not that little bit more inspired to! I’m lucky to live in Cumbria! And you’re right about Hardknot! Many cars can’t even make it up there! The photos, especially the first couple, are simply fantastic. Definitely makes me want to head up a hill with my camera very soon! It looks beautiful! Lake District is one of the places I haven’t visited yet but would love to. I will see whether I can do it this year. But I’ve been to Scotland and it’s so beautiful there, have really been blown away by the scenery.